The Linnaeus Microbial Observatory (LMO) is a time-series in the Baltic Sea Proper and the core of many research projects in microbial oceanography at Linnaeus University. Since 2011, we have collected samples at over 270 time points, and currently samples are collected biweekly. For years, the Baltic Sea has been affected by eutrophication and overfishing. Now, climate change threatens to accentuate these human-induced effects leading to ecosystem changes of hitherto unprecedented magnitudes. To interpret and predict the responses of the Baltic Sea to climate change, the Swedish governmental strong research programme "EcoChange" investigates basin-specific food-web responses to environmental forcing (from bacteria to fish). Our work includes investigating a series of interactions, from microbes to higher organisms, using a suite of state-of-the-art microbial ecology and molecular biology approaches. Activity and diversity of particle attached and free-living marine bacteria, in collaboration with Dr. Sandra Martinez-Garcia, University of Vigo, Spain. Phytoplankton-bacteria interactions and linkages using transcriptomics approaches, in collaboration with Dr. Rachel Foster, Stockholm University. Abundances of bacterial, phytoplankton and zooplankton groups and taxonomic identifications. DNA and metagenomic samples for viruses, phytoplankton and bacteria. Gene and protein expression data from phytoplankton and bacterioplankton communities. 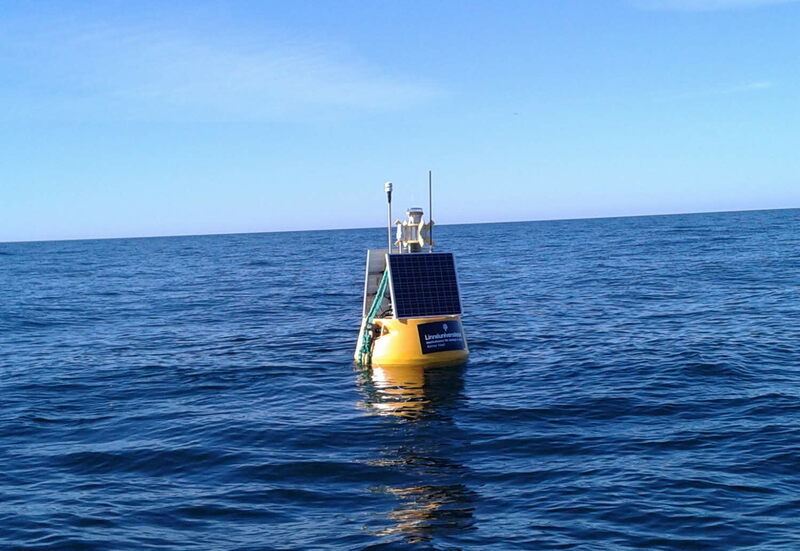 Cell abundance data is also being attempted to be used by the Baltic. Nest Institute, which does ecosystem modeling and advising for HELCOM, and is a highly influential group that helps to establish regulations for Baltic Sea emissions. We greatly acknowledge the support of EON, Northern Offshore Service (NOS) and the Kårehamn guest-harbor during our sampling efforts. Šulčius, S., Šimoliūnas, E., Alzbutas, G., Gasiūnas, G., Jauniškis, V., Kuznecova, J., Miettinen, S., Nilsson, E., Meškys, R., Roine, E., Paškauskas, R., & Holmfeldt, K. (2018). Genomic characterization of cyanophage vB_AphaS-CL131 infecting filamentous diazotrophic cyanobacterium Aphanizomenon flos-aquae reveals novel insights into virus-bacterium interactions. Applied and Environmental Microbiology. In press. Šulčius, S., Mazur-Marzec, H., Vitonytė, I., Kvederavičiūtė, K., Kuznecova, J., Šimoliūnas, E., & Holmfeldt, K. (2018). Insights into cyanophage-mediated dynamics of nodularin and other non-ribosomal peptides in Nodularia spumigena. Harmful Algae. 78:69-74. Fridolfsson, E., Lindehoff, E., Legrand, C. and Hylander, S. (2018) Thiamine (vitamin B1) content in phytoplankton and zooplankton in the presence of filamentous cyanobacteria. Limnology and Oceanography. 63:2423-2435. Lindh, M. V. and J. Pinhassi. (2018). Sensitivity of bacterioplankton to environmental disturbance: a review of Baltic Sea field studies and experiments. Frontiers in Marine Science. 5:361. Paerl, R. W., J. Sundh, D. Tan, S. L. Svenningsen, S. Hylander, J. Pinhassi, A. F. Anderson, L. Riemann. (2018). Prevalent reliance of bacterioplankton on exogenous vitamin B1 and precursor availability. Proceedings of the National Academy of Sciences USA. 115:E10447-E10456. Alneberg, J., C. M. G. Karlsson, A.-M. Divne, C. Bergin, F. Homa, M. V. Lindh, L. W. Hugerth, T. J. G Ettema, S. Bertilsson, A. F. Andersson, and J. Pinhassi. (2018). Genomes from uncultivated prokaryotes: a comparison of metagenome-assembled and single-amplified genomes. Microbiome. 6:173. Berner, C., M. Bertos-Fortis, J. Pinhassi, C. Legrand. (2018). Response of microbial communities to changing climate conditions during summer cyanobacterial blooms in the Baltic Sea. Frontiers in Microbiology. 9:Article 1562. Alneberg, J., J. Sundh, C. Bennke, S. Beier, D. Lundin, L. W. Hugerth, J. Pinhassi, V. Kisand, L. Riemann, K. Jürgens, M. Labrenz, A. F. Andersson. (2018). BARM and BalticMicrobeDB, a reference metagenome and interface to meta-omic data for the Baltic Sea. Scientific Data. 5:180146. Broman, E., V. Sachpazidou, J. Pinhassi, and M. Dopson. (2017). Oxygenation of hypoxic coastal Baltic Sea sediments impacts on chemistry, microbial community composition, and metabolism. Frontiers in Microbiology. 8:Article 2453. Broman, E., J. Sjöstedt, J. Pinhassi, and M. Dopson. (2017). Shifts in coastal sediment oxygenation cause pronounced changes in microbial community composition and associated metabolism. Microbiome. 5:96. Broman, E., Sachpazidou, V., Dopson, M., Hylander, S. (2017). Diatoms dominate the eukaryotic metatranscriptome during spring in coastal `dead zone´ sediments. Proceedings of the Royal Society of London. Biological Sciences.284:20171617. Bunse, C. and J. Pinhassi. (2017). Marine bacterioplankton seasonal succession dynamics. Trends in Microbiology. 25:464-505. Lindh, M. V., J. Sjöstedt, B. Ekstam, M. Casini, D. Lundin, L. W. Hugerth, Y. O. O. Hue, A. F. Andersson, A. Andersson, C. Legrand, and J. Pinhassi. (2017). Metapopulation theory identifies biogeographical patterns among core and satellite marine bacteria scaling from tens to thousands of kilometers. Environmental Microbiology. 19:1222-1236. Howard-Varona, C., Roux, S., Dore, H., Solonenko, N.E., Holmfeldt, K., Markillie, L.M., Orr, G., Sullivan, M.B. (2017) Regulation of infection efficiency in a globally abundant marine Bacteriodetes virus. ISME Journal. 11:284-295. Šulčius, S. and Holmfeldt, K. (2016). Viruses of microorganisms in the Baltic Sea: Current state of research and perspectives. Marine Biology Research. 12:115-124. Brüsin, M., Svensson, P.A., Hylander, S. (2016). Individual changes in zooplankton pigmentation in relation to ultraviolet radiation and predator cues.Limnology and Oceanography. 61:1337-1344. Baltar, F., Legrand, C., Pinhassi, J. (2016). Cell-free extracellular enzymatic activity is linked to seasonal temperature changes: a case study in the Baltic Sea. Biogeosciences 13 (9): 2815-2821. Bertos-Fortis, M., Farnelid, H. M., Lindh, M. V., Casini, M., Andersson, A., Pinhassi, J., Legrand, C. (2016). Unscrambling cyanobacteria community dynamics related to environmental factors. Frontiers in Microbiology. 7:Article 625. Brindefalk, B., Ekman, M., Ininbergs, K., Dupont, C. L., Yooseph, S., Pinhassi, J., Bergman, B. (2016). Distribution and expression of microbial rhodopsins in the Baltic Sea and adjacent waters. Environmental Microbiology. 18:4442–4455. Bunse, C., Bertos-Fortis, M., Sassenhagen, I., Sildever, S., Sjöqvist, C., Godhe, A., Gross, S., Kremp, A., Lips, I., Lundholm, N., Rengefors, K., Sefbom, J. Pinhassi, J., Legrand, C. (2016). Spatio-temporal interdependence of bacteria and phytoplankton during a Baltic Sea spring bloom. Frontiers in Microbiology. 7:Article 517. Godhe, A., Sjoqvist, C., Sildever, S., Sefbom, J., Hardardottir, S., Bertos-Fortis, M., Bunse, C., Gross, S., Johansson, E., Jonsson, P. R., Khandan, S., Legrand, C., Lips, I., Lundholm, N., Rengefors, K. E., Sassenhagen, I., Suikkanen, S., Sundqvist, L., Kremp, A. (2016). Physical barriers and environmental gradients cause spatial and temporal genetic differentiation of an extensive algal bloom. Journal of Biogeography 43(6): 1130-1142. Holmfeldt, K., Solonenko, N., Howard-Varona, C., Moreno, M., Malmstrom, R.R., Blow, M.J., Sullivan, M.B. (2016). Large-scale maps of variable infection efficiencies in aquatic Bacteroidetes phage-host model systems. Environmental Microbiology. 18:3949-3961. Lindh, M. V., Sjöstedt, J., Casini, M., Andersson, A., Legrand, C., Pinhassi, J. (2016). Local environmental conditions shape generalist but not specialist components of microbial metacommunities in the Baltic Sea. Frontiers in Microbiology. 7:Article 2078. Lundgren, V. M., Glibert P. M., Granéli, E., Vidyarathna, N. K., Fiori, E., Ou, L., Flynn, K. J., Mitra, A., Stoecker, D. K., Hansen, P. J. (2016). Metabolic and physiological changes in Prymnesium parvum when grown under, and grazing on prey of, variable nitrogen:phosphorus stoichiometry. Harmful Algae 55:1–12. Mazur-Marzec, H., Bertos-Fortis, M., Torunska-Sitarz, A., Fidor, A., Legrand, C. (2016). Chemical and Genetic Diversity of Nodularia spumigena from the Baltic Sea. Marine Drugs 14(11). Savela, H., Harju, K., Spoof, L., Lindehoff, E., Meriluoto, J., Vehniainen, M., Kremp, A. (2016). Quantity of the dinoflagellate sxtA4 gene and cell density correlates with paralytic shellfish toxin production in Alexandrium ostenfeldii blooms. Harmful Algae 52: 1-10. Vaquer-Sunyer, R., Reader, H. E., Muthusamy, S., Lindh, M. V., Pinhassi, J., Conley, D. J., and Kritzberg, E. S. (2016). Effects of wastewater treatment plant effluent inputs on planktonic metabolic rates and microbial community composition in the Baltic Sea. Biogeosciences. 13:4751–4765. Broman, E., Brüsin, M., Dopson, M., Hylander, S. (2015). Oxygenation of anoxic sediments triggers hatching of zooplankton eggs. Proceedings of the Royal Society of London. Biological Sciences. 282:20152025. Andersson, A., Meier, H. E. M., Ripszam, M., Rowe, O., Wikner, J., Haglund, P., Eilola, K., Legrand, C., Figueroa, D., Paczkowska, J., Lindehoff, E., Tysklind, M., Elmgren, R. (2015). Projected future climate change and Baltic Sea ecosystem management. Ambio 44: S345-S356. Hugerth, L. W., Larsson, J., Alneberg, J., Lindh, M. V., Legrand, C., Pinhassi, J., Andersson, A. F. (2015). Metagenome-assembled genomes uncover a global brackish microbiome. Genome Biology. 16:279. Legrand, C., Fridolfsson, E., Bertos-Fortis, M., Lindehoff, E., Larsson, P., Pinhassi, J., Andersson. A. (2015). Interannual variability of phyto-bacterioplankton biomass and production in coastal and offshore waters of the Baltic Sea. AMBIO. 44(Suppl 3):S427-S438. Lindh, M. V., Sjöstedt, J., Andersson, A. F., Baltar, F., Hugerth, L., Lundin, D., Muthusamy, S., Legrand, C., Pinhassi, J. (2015). Disentangling seasonal bacterioplankton population dynamics by high frequency sampling. Environmental Microbiology. 17(7):2459–2476. Lindh, M. V., Lefébure, R., Degerman, R., Lundin, D., Andersson, A., Pinhassi, J. (2015). Consequences of increased terrestrial dissolved organic matter and temperatures on bacterioplankton community composition during a mesocosm experiment in the Baltic Sea. AMBIO. 44(Suppl. 3):S402–S412. Lindh, M. V., Figueroa, D., Sjöstedt, J., Baltar, F., Lundin, D., Andersson, A., Legrand, C., Pinhassi, J. (2015). Transplant experiments uncover Baltic Sea basin-specific responses in bacterioplankton community composition and metabolic activities. Frontiers in Microbiology. 6:Article 223. Olofsson, M., Lindehoff, E., Frick, B., Svensson, F., Legrand, C. (2015). Baltic Sea microalgae transform cement flue gas into valuable biomass. Algal Research-Biomass Biofuels and Bioproducts 11: 227-233. Vaquer-Sunyer, R., Conley, D. J., Muthusamy, S., Lindh, M. V., Pinhassi, J., Kritzberg, E. S. (2015). Dissolved organic nitrogen inputs from wastewater treatment plant effluents increase responses of planktonic metabolic rates to warming. Environmental Science and Technology. 49(19):11411-11420. Bentzon-Tilia, M., Farnelid, H., Jürgens, K., Riemann, L. (2014). Cultivation and isolation of N2-fixing bacteria from suboxic waters in the Baltic Sea. FEMS Microbiology Ecology 88: 358-371. Bentzon-Tilia, M., Riemann, L. Gram, L. (2014). Draft genome sequence of Hoeflea sp. strain BAL378, a potential producer of bioactive compounds. Genome Announcements 2 (6), e01213-14. Dupont, C. L., Larsson J., Yooseph, S., Ininbergs, K., Goll, J., Asplund-Samuelsson, J., McCrow, J. P., Celepli, N., Zeigler-Allen, L., Ekman, M., Lucas, A. J., Hagström, Å., Thiagarajan, M., Brindefalk, B., Richter, R. A., Andersson, A. F., Tenney, A., Lundin, D., Tovchigrechko, A., Nylander, J. A. A., Brami, D., Badger, J. H., Allen, A. E., Rusch, D. B., Hoffman, J., Norrby, E., Friedman, R., Pinhassi, J., Venter, J. C., Bergman, B. (2014). Functional tradeoffs underpin salinity-driven divergence in microbial community composition. PLoS ONE. 9:e89549. Farnelid, H., Harder, J., Bentzon-Tilia, M., and Riemann, L. (2014) Isolation of heterotrophic diazotrophic bacteria from estuarine surface waters. Environmental Microbiology 16: 3072-3082. Olofsson, M., Lamela, T., Nilsson, E., Berge, J. P., del Pino, V., Uronen, P., Legrand, C. (2014). Combined Effects of Nitrogen Concentration and Seasonal Changes on the Production of Lipids in Nannochloropsis oculata. Marine Drugs 12(4): 1891-1910. Pérez Blanco, E., Karlsson, C., Pallon, J., Granéli, E. (2014). Composition of carbon, nitrogen and phosphorus in single cells of three filamentous cyanobacteria using nuclear microprobe and traditional techniques. Aquatic Microbial Ecology 71:91-97. Sun, X., Olofsson, M., Andersson, P. S., Fry, B., Legrand, C., Humborg, C., Morth, C. M. (2014). Effects of growth and dissolution on the fractionation of silicon isotopes by estuarine diatoms. Geochimica Et Cosmochimica Acta 130: 156-166. Dinasquet, J., Kragh, T., Schrøter, M. L., Søndergaard, M., Riemann, L. (2013). Functional and compositional succession of bacterioplankton in response to a gradient in bioavailable dissolved organic carbon. Environmental Microbiology 15 (9), 2616-2628. Farnelid, H., Bentzon-Tilia, M., Andersson, A. F., Bertilsson, S., Jost, G., Labrenz, M., Jürgens, K., Riemann, L. (2013). Active nitrogen-fixing heterotrophic bacteria at and below the chemocline of the central Baltic Sea. The ISME Journal. 7 (7), 1413-1423. Holmfeldt, K., Solonenko, N., Shah, M., Corrier, K., Riemann, L., Verberkmoes, N.C., Sullivan, M.B. (2013). Twelve previously unknown phage genera are ubiquitous in global oceans. Proceedings of the National Academy of Sciences of the Unites States of America. 110:12798-12803. Blanco, E. P., Karlsson, C., Pallon, J., Granéli, E. (2012). Elemental composition of C, N and P in single cells of three filamentous cyanobacteria using nmp (nuclear microprobe) and traditional techniques. Poster, Linnaeus ECO-TECH 2012, Kalmar, Sweden, November 26-28, 2012. Gómez-Consarnau, L., Lindh, M., Gasol, J. M., and Pinhassi, J. (2012). Structuring of bacterioplankton communities by specific dissolved organic carbon compounds. Environmental Microbiology. 14:2361-2378. Granéli, E., Esplund, C., Lindehoff, E., Brutemark, A. (2012). Minimizing economical losses with the help of “real-time” algal surveillance. Poster, Linnaeus ECO-TECH 2012, Kalmar, Sweden, November 26-28, 2012. Holmfeldt, K., Odic, D., Sullivan, M.B., Middelboe, M., Riemann, L. (2012). Cultivated Single-Stranded DNA Phages That Infect Marine Bacteroidetes Prove Difficult To Detect with DNA-Binding Stains. Applied and Environmental Microbiology. 78:892-894. Lundgren, V., Granéli, E., Pflugmacher, S. (2012). Influence of Acartia cf. bifilosa (Copepoda) on morphology and toxicity of Nodularia spumigena (Cyanophyceae). Harmful Algae 18:35-46. Sjöstedt, J., Koch-Schmidt, P., Pontarp, M., Canbäck, B., Tunlid, A., Lundberg, P., Hagström, Å., Riemann, L. (2012). Recruitment of members from the rare biosphere of marine bacterioplankton communities after an environmental disturbance. Applied and Environmental Microbiology 78 (5), 1361-1369. Lindehoff, E., Granéli, E., Glibert, P. M. (2011). Nitrogen uptake kinetics of Prymnesium parvum (Haptophyte). Harmful Algae 12:70-76. Persson, K. J., Stenroth, P., Legrand, C. (2011). Effects of the filamentous cyanobacterium Nodularia on fitness and feeding behavior of young-of-the-year (YOY) Eurasian perch (Perca fluviatilis). Toxicon 57(7-8): 1033-1040. Sundbäck, K., Lindehoff, E., Granéli, E. (2011). Dissolved organic nitrogen: an important source of nitrogen for the microphytobenthos in sandy sediment. Aquati Microb Ecol. 63:89-100. Bowers, H. A., Brutemark, A., Carvalho, W. F., Graneli, E. (2010). Combining flow cytometry and real-time PCR methodology to demonstrate consumption by Prymnesium parvum. JAWRA 46:133-143. Carvalho, W. F.,Granéli, E. (2010). Contribution of phagotrophy versus autotrophy to Prymnesium parvum growth under nitrogen and phosphorus sufficiency and deficiency. Harmful Algae 9:105–115. Granéli, E., Esplund, C. (2010). Blågrönalger i Östersjön (Blue-green algae in the Baltic Sea, In Swedish). Naturvårdsverket (Swedish EPA) och Havsmiljöinstitutets (The Swedish Institute for the Marine Environment) rapport Havet 2010:35-38. Lindehoff, E., Granéli, E., Glibert, P. M., (2010). Influence of prey and nutritional status on the rate of nitrogen uptake by Prymnesium parvum (haptophyte). JAWRA 46:121-132. Brutemark, A., Lindehoff , E., Graneli, E., Graneli, W. (2009). Carbon isotope signature variability among cultured microalgae: Influence of species, nutrients and growth. Journal of Experimental Marine Biology and Ecology 372:98-105. Farnelid, H., Öberg, T., Riemann, L. (2009). Identity and dynamics of putative N2‐fixing picoplankton in the Baltic Sea proper suggest complex patterns of regulation. Environmental Microbiology Reports 1 (2), 145-154. Lindehoff, E., Granéli, E., Granéli, W. (2009). Effect of tertiary sewage effluent additions on Prymnesium parvum cell toxicity and stable isotope ratios. Harmful Algae 8:247-253. Sopanen, S., Uronen, P., Kuuppo, P., Svensen, C., Rühl, A., Tamminen, T., Graneli, E., Legrand, C. (2009). Transfer of nodularin to copepod Eurytemora affinis through the microbial food web. Aquat Microb Ecol 55:115-130. Carvalho, W. F., Minnhagen, S., Granéli, E. (2008). Dinophysis novergica (Dinophyceae), more a predator than a producer? Harmful Algae 7:174-183. Granéli, E., Esplund, C., Legrand, C., Franzén, H., Granéli, C. (2008). Minimizing economical losses with the help of “real-time” HAB surveillance. In: Moestrup, Ø, et al (Eds.) Harmful Algae. ISSHA and IOC- UNESCO, Copenhagen. pp 152-154. Granéli, E., Granéli, W. (2008). Nitrogen in Inland Seas. In: Capone DG, Bronk DA, Mulholland MR and Carpenter EJ (eds). Nitrogen in the Marine Environment, 2nd Edition, Academic Press, San Diego, 2008, pp: 683-704. Riemann, L., Leitet, C., Pommier, T., Simu, K., Holmfeldt, K., Larsson, U., Hagström, Å. (2008). The native bacterioplankton community in the central Baltic Sea is influenced by freshwater bacterial species. Applied and Environmental Microbiology. 74:503-515. Sopanen, S., Koski, M., Uronen, P., Kuuppo, P., Lehtinen, S., Legrand, C., Tamminen, T. (2008). Prymnesium parvum exotoxins affect the grazing and viability of the calanoid copepod Eurytemora affinis. Marine Ecology Progress Series 361: 191-202. Boström, K. H., Riemann, L., Kühl, M., Hagström, Å. (2007). Isolation and gene quantification of heterotrophic N2‐fixing bacterioplankton in the Baltic Sea. Environmental Microbiology 9 (1), 152-164. Boström, K. H., Riemann, L., Zweifel, U. L., Hagström, Å. (2007). Nodularia sp. nifH gene transcripts in the Baltic Sea proper. Journal of Plankton Research 29 (4), 391-399. Holmfeldt, K., Middelboe, M., Nybroe, O., Riemann, L. (2007). Large variabilities in host strain susceptibility and phage host range govern interactions between lytic marine phages and their Flavobacterium hosts. Applied and Environmental Microbiology 73 (21), 6730-6739. Kozlowsky-Suzuki, B., Karjalainen, M., Koski, M., Carlsson, P., Stolte, W., Balode, M., Granéli, E. (2007). Disruption of the microbial food web and inhibition of metazooplankton. development in the presence of iron and DOM-stimulated Baltic Sea cyanobacteria. Mar Ecol Prog Ser 337: 15-26. Stolte, W., Balode, M., Carlsson, P., Grzebyk, D., Janson, S., Lips, I., Panosso, R., Ward, C. J., Granéli, E. (2007). Stimulation of nitrogen-fixing cyanobacteria in a Baltic Sea plankton community by land-derived organic matter or iron addition. Mar Ecol Progr Ser 327:71-82. Carvalho, W. F., Granéli, E. (2006). Acidotropic probes and flow cytometry: a powerful combination for detecting phagotrophy in mixotrophic and heterotrophic protists. Aquat Microb Ecol 44:85-96. Kozlowsky-Suzuki, B., Carlsson, P., Rühl, A., Granéli, E. (2006). Food selectivity and grazing impact on toxic Dinophysis spp. by copepods feeding on natural plankton assemblages. Harmful Algae 5: 57-68. Leitet, C., Riemann, L., Hagström, Å. (2006). Plasmids and prophages in Baltic Sea bacterioplankton isolates. Journal of the Marine Biological Association of the United Kingdom. 86(3), 567–575. Salomon, P. S., Janson, S., Gisselson, L., Granéli, E. (2006). Analytical detection of parasite infection of Dinophysis norvegica using FISH probes. Afr J Mar Sci 28(2): 353-355. Strogyloudi, E., Giannakourou, A., Legrand, C., Rueh, A., Granéli, E. (2006). Estimating the accumulation and transfer of Nodularia spumigena toxins by the blue mussel Mytilus edulis: an appraisal from culture and mesocosm experiments. Toxicon 48: 359-372. Fistarol, G. O., Legrand, C., Granéli, E. (2005).Allelopathic effect on a nutrient-limited phytoplankton species. Aquat Microb Ecol 41: 153-161. Hagström, J. A., Granéli, E. (2005). Removal of Prymnesium parvum (Haptophyceae) cells under different nutrient conditions by clay. Harmful Algae 4: 249-260. Råberg, S., Jönsson, R. B., Björn, A., Granéli, E., Kautsky, L. (2005). Effects of Pilayella littoralis on Fucus vesiculosus recruitment: implications for community composition. Mar Ecol Prog Ser 289: 131-139. Sengco, M. R., Hagström, J. A., Granéli, E., Anderson, D. M. (2005). Removal of Prymnesium parvum (Haptophyceae) and its toxins using clay minerals. Harmful Algae 4: 261-274. Simu, K., Holmfeldt, K., Zweifel, U. L., Hagstrom, Å. (2005). Culturability and coexistence of colony-forming and single-cell marine bacterioplankton. Applied and Environmental Microbiology. 71:4793-4800. Suikkanen, S., Fistarol, G. O., Granéli, E. (2005). Effects of cyanobacterial allelochemicals on a natural plankton community.Mar Ecol Prog Ser 287: 1-9. Svensen, C., Strogyloudi, E., Wexels- Riser, C., Dahlmann, J., Legrand, C., Wassmann, P., Granéli, E., Pagou, K. (2005). Reduction of cyanobacterial toxins through coprophagy in Mytilus edulis. Harmful Algae 4: 329-336. Berger, R., Bergström, L., Granéli, E., Kautsky, L. (2004). How does eutrophication affect different life stages of Baltic Fucus vesiculosus in the Baltic Sea? - a conceptual model. Hydrobiologia 514: 243-248. Boström, K. H., Simu, K., Hagström, Å., Riemann, L. (2004). Optimization of DNA extraction for quantitative marine bacterioplankton community analysis. Limnology and Oceanography Methods 2, 365-373. Suikkanen, S., Fistarol, G. O., Granéli, E. (2004). Allelopathic effects of the Baltic cyanobacteria Nodularia spumigena, Aphanizomenon flos-aquae and Anabaena lemmermannii on algal monocultures. J Exp Mar Biol Ecol 308: 85-101. Fistarol, G. O., Legrand, C., Granéli, E. (2003). Allelopathic effect of Prymnesium parvum on a natural plankton community. Mar Ecol Prog Ser 255: 115-125. Granéli, E., Johansson, N. (2003). Effects of the toxic haptophyte Prymnesium parvum on the survival and feeding of a ciliate: the influence of different nutrient conditions. Mar Ecol Prog Ser 254: 49-56. Granéli, E., Johansson, N. (2003). Increase in the production of allelopathic substances by Prymnesium parvum cells grown under N- or P- deficient conditions. Harmful Algae2: 135-145. Salomon, P. S., Janson, S., Granéli, E. (2003). Molecular identification of bacteria associated to filaments of Nodularia spumigena and their effect on the cyanobacterial growth. Harmful Algae 2: 261-272. Salomon, P. S., Janson, S., Granéli, E. (2003). Parasitism of Dinophysis norvegica by Amoebophrya sp. In the Baltic Sea. Aquat Microb Ecol 33: 163-172. Skovgaard, A., Legrand, C., Hansen, P. J., Granéli, E. (2003). Effects of nutrient limitation on food uptake in the toxic haptophyte Prymnesium parvum. Aquat Microb Ecol 31: 259-265. Thoren, A. K., Legrand, C., Herrmann, J. (2003). Transport and transformation of de-icing urea from airport runways in a constructed wetland system. Water Science and Technology 48(5): 283-290. Gisselson, L.-Å., Carlsson, P., Granéli, E., Pallon J. (2002). Dinophysis blooms in the deep euphotic zone of the Baltic Sea: do they grow in the dark? Harmful Algae 1: 401-418. Janson, S., Granéli, E. (2002). Phylogenetic analyses of nitrogen-fixing cyanobacteria from the Baltic Sea reveal sequence anomalies in the phycocyanin operon. Int J Syst Evol Microbiol 52: 1397-1404. Stolte, W., Karlsson, C., Carlsson, P., Granéli, E. (2002). Modeling the increase of nodularin content in Baltic Sea Nodularia spumigena during stationary phase in phosphorus-limited batch cultures. FEMS Microbiol Ecol 41: 211-220. Stolte, W., Panosso, R., Gisselson, L.-Å., Granéli, E. (2002). Utilization efficiency of nitrogen associated with riverine dissolved organic carbon (>1 kDa) by two toxin producing phytoplankton species. Aquat Microb Ecol 29: 97-105. Dahlmann, J., Rühl, A., Hummert, C., Liebezeit, G., Carlsson, P., Granéli, E. (2001). Different methods for toxin analysis in the cyanobacterium Nodularia spumigena (Cyanophyceae). Toxicon 39: 1183-1190. Dahlmann, J., Rühl, A., Liebezeit, G., Granéli, E. (2001). Evaluation of a bioluminescence assay for detection of nodularin as an alternative to HPLC and protein phosphatase inhibition assay. In: Hallegraeff GM, Blackburn SI, Bolch CJ, Lewis R.J. (eds) Harmful Algal Blooms 2000. Intergov Oceanographic Commission of UNESCO, pp. 296-298. Gisselson, L.-Å., Granéli, E., Pallon, J. (2001). Variation in cellular nutrient status within a population of Dinophysis norvegica (Dinophyceae) growing in situ: single-cell elemental analysis by use of a Nuclear Microprobe. Limnol Oceanogr 46(5): 1237-1242. Janson S., Gisselson, L.-Å., Salomon, P. S., Granéli, E. (2000). Evidence for multiple species within the endoparasitic dinoflagellate Amoebophrya ceratii as based on 18S rRNA gene-sequence analysis. Parasitol Res 86: 929-933. Panosso, R., Granéli, E. (2000). Effects of dissolved organic matter on the growth of Nodularia spumigena (Cyanophyceae) cultivated under N or P deficiency. Mar Biol136: 331-336. Hummert, C., Reichelt, M., Legrand, C., Granéli, E., Luckas, B. (1999). Rapid clean-up and effective sample preparation procedure for unambiguous determination of the cyclic peptides microcystin and nodularin. Chromatographia 50: 173-180. 2010. Granéli E., Esplund C., Romero C., Lundgren V. Effekter av muddring på närsaltökning och stimulans av skadliga blågrönalgsblomingar under sommaren 2010. Övervakning av algblomning juli – augusti. Rapport till OKG Oskarshamn. 2006. Granéli E., Esplund C., Legrand C., Franzén H., Granéli C. Algövervakning – ett verktyg för hållbar utveckling i kustområden. Rapport från Algövervakningsprojektet och informationstjänsten ”Fröken Alg” för Öland och Kalmar 1 juli-15 augusti 2006.